I know what you are thinking. Is she REALLY writing a post on this style blog about a pair of Crocs?? Trust me, I felt the same way at first. I went into this summer with a pair of Old Navy flip flops and a couple pairs of cute super flat sandals that were not cutting it for my daily active life of chasing a 2 year old. I needed support, the ability to get them wet, more than just a flip flop because of how active we are and, of course, wanted them to be fashionable. Forgetting the last requirement, those parameters led me into the dangerous category of outdoor sandals. 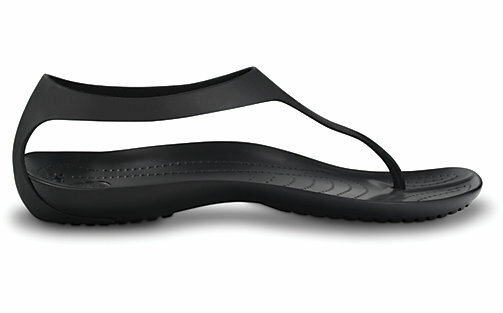 Initially, I did lean in the direction of Keen or Teva type sandal, but decided they just weren’t me. (Actually it was probably more my sister and husband giving me a hard time about “those” types of shoes that did it for me) I was surfing Zappos when these Crocs caught my eye. Could I really order a pair of Crocs? Well, I did and I have to say they are exactly what I was looking for. The support under the foot and heel was just what I needed for our walks to the coffee shop/beach and the styling makes them look more like a fashionable sandal than an athletic/outdoor type sandal. The only hitch I had with these was the back ankle strap did rub the back of my right heel the first time I wore them, so I wore a bandaid the next 2-4 times that I had them on. Since then, I haven’t had a problem at all. PRICE: $29.99 – But $19.99 on the Crocs website right now! I was not compensated for my review. I purchased these sandals on my own. As always, opinions are mine.